Cut each orange in half. Remove orange sections, leaving the cup of rind. Continue until all 9 oranges are cut in half and scooped out (so 18 orange cups are ready). 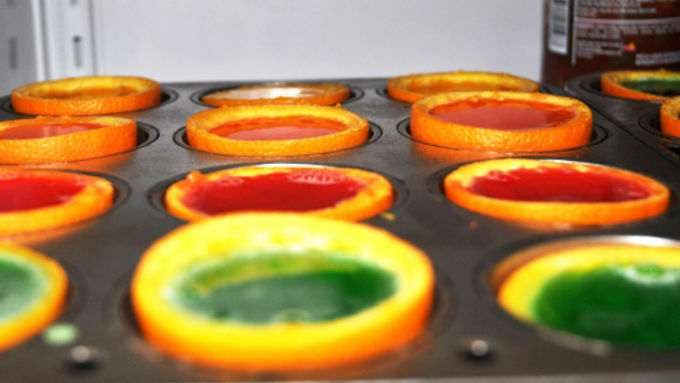 Set orange cups in muffin tins to keep each upright. Set aside. Prepare six flavors of gelatin according to package directions, one at a time. With each flavor, fill 3 orange cups, filling up to the edge of the cup. Pour leftover gelatin into a food storage container and refrigerate to use as desired later. Repeat until all 6 flavors are made and all 18 orange cups are filled. Carefully place muffin tins into the refrigerator and chill at least 4 hours (overnight is better) until fully set. Remove each orange cup from the muffin tin and, using a sharp knife, slice into three wedges. Continue until all orange cups are sliced into colorful wedges. Place wedges on a serving platter in rainbow-color order (light to dark). Serve immediately, or return plate of wedges to the refrigerator until serving time. 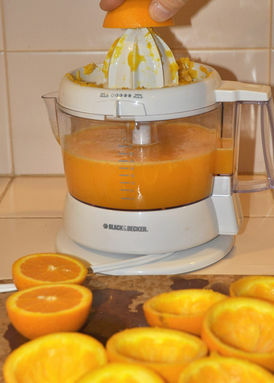 Use an electric citrus juicer (the kind that easily juices lemon and orange halves) to make the orange cups, which made that step super quick -- and with the added benefit that we ended up with awesome homemade orange juice too! Also, if you want more than 54 wedges, just use more oranges. You have plenty of leftover gelatin to fill them. Use your choice of gelatin for special occasions or to coordinate with team or theme parties. Our bloggers have turned some ordinary edibles into extraordinary incredibles by adding rainbow colors. From bread and donuts to pancakes and cheesecake, food never looked so happy. Then, just when we thought our rainbow was fading, this article jiggled its way into our hearts from BuzzFeed.com, and we knew we had to give it a try. 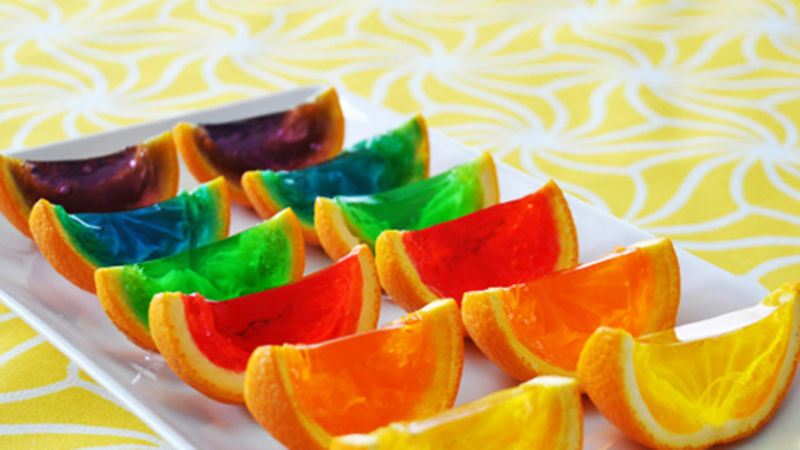 Rainbow Gelatin Orange Wedges -- bright translucent smiles of gelatin that catch sunlight like a prism -- are a total score! 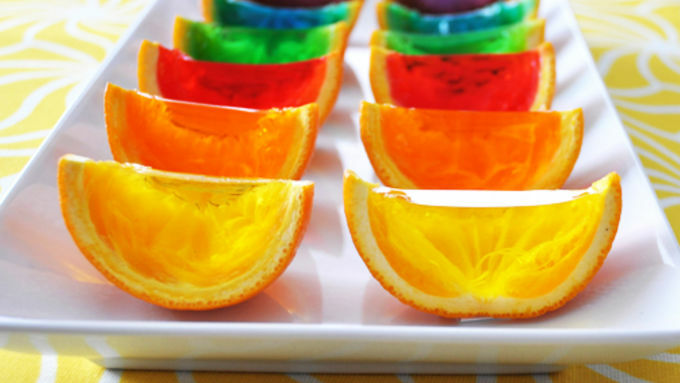 What could be easier than adding water to boxed gelatin and pouring it into orange-rind cups? This is one killer creative presentation. Come on -- give it a try! This is an easy and fun recipe for summer. First, wash 9 oranges and cut them in half. You can scoop them out and use the orange sections for a salad, or do it the cheater's way (yah, this is what I did) with an electric juicer. Voila! The orange cups are ready in just a couple minutes -- and you get some freshly squeezed orange juice to boot! For the gelatin you can use whatever brand you want, but for rainbow wedges just like ours, you'll need six flavors -- lemon, orange, strawberry, lime, blueberry and grape. Rainbow-licious! I made the gelatin two colors at a time and it was a piece of cake. Using 9 oranges (so 18 orange cups), you will have a lot of leftover gelatin. I just refrigerated mine in covered containers for another time, but you could make lots more orange cups if you want and fill those too. You can put some wax paper or plastic wrap over the top if you want. The gelatin box says to give it 4 hours until it's set, but I let mine tango with the salsa jar in the fridge overnight. Since we're slicing these up, we need them good and set, not kinda-sorta there. With a sharp knife, slice each cup into 3 or 4 wedges (depending on the size of your oranges and how big you want your wedges). So, what could be more awesome than this on a picnic table?